A diet rich in red meat is bad for the planet, not just an individual’s small colon, as — according to some estimates — livestock production accounts for the same amount of global carbon emissions annually as the transportation industry. A recent experiment to see if cows can produce less methane offers hope to steak-loving tree huggers, if that isn’t an oxymoron. Greenhouse gas emissions are the main cause of climate change and of the wilder weather that continues to wreck lives, most recently evidenced by the cyclone in southeast Africa. Individuals’ efforts to reduce their carbon footprint — like turning down the thermostat a notch and driving an energy efficient car — can only go so far, because some aspects of modern life produce far more than can be offset by individual measures. One industry that produces inordinate amounts of greenhouse gases is cattle ranching, and the richer the world’s population becomes, the more demand rises for red meat. There has been plenty of work aimed at stopping cows producing all that extra methane. Researchers have tried vaccines, rearing particular breeds that are naturally less gassy, and microbiome transfers, but all of them produced disappointing results. 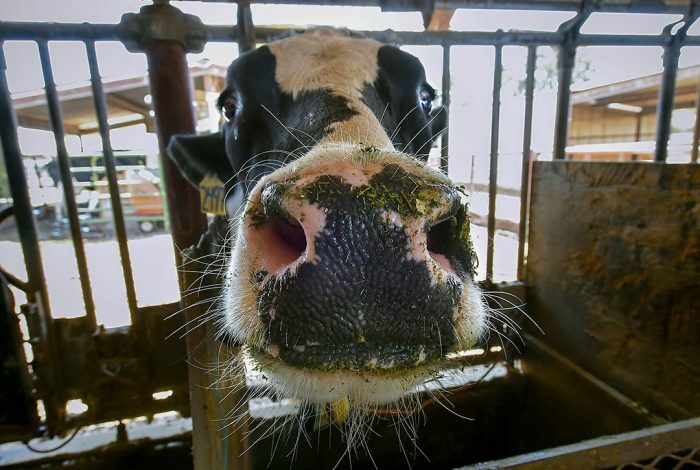 Scientists from the animal sciences department at UC Davis in California gave a small number of heifers seaweed-laced feed to see what effect it would have on their burping, which is a byproduct of their digestive process. When ruminants break down the carbohydrates in the grasses they eat, it produces hydrogen gas. Then microorganisms inside their gut feed on the hydrogen, which produces the greenhouse gas methane. Cows expel 95 percent of the methane out of their mouths, not out the other end as is commonly believed. The UC Davis team concluded that if cows were to eat as little as two percent of seaweed in their diet it could reduce their methane emissions by up to 60 percent. And according to a farmer in the north of England, it’s good for them too. Graham Tweddle runs an organic dairy farm in the north of England, and feeds his cows a seaweed-infused diet during the winter months — when they are kept in sheds thanks to the cold, damp, miserable weather. “The feed is expensive but the cows love it and it certainly boosts their immune systems,” he told his local newspaper. “Their milk then benefits customers by being higher in antioxidants and iodine which helps brain development.” The iodine is the magic ingredient in the seaweed. Tweddle’s herd must qualify for the Most-Pampered Farm Animals prize, because alongside the organic feed their stock sheds are kitted out with memory foam mattresses and automatic grooming brushes. Dr. Ermias Kebreab and his team at UC Davis are carrying out further tests to see whether this idea can be scaled out to be of any use, and to see what if any effect the seaweed has on milk’s taste. One major roadblock could be whether it’s possible to grow enough seaweed to feed the millions of cows on the planet, but efforts are afoot to see if it can be done. This week’s video shows Professor Kebreab interviewed on local TV — where he sets the giggly anchors straight about which end cows emit their gas from. Related front page panorama photo credit: Adapted by WhoWhatWhy from Daniel Rowe / Flickr (CC BY-NC 2.0) and Brian Dunlay / Flickr (CC BY-NC-SA 2.0).